University of Hawai‘i‒West O‘ahu alumna Nancy Richards (BA ’97) was born and raised in Georgia and is undeniably proud of her southern roots. So how did she come to be a student at UH West O‘ahu? 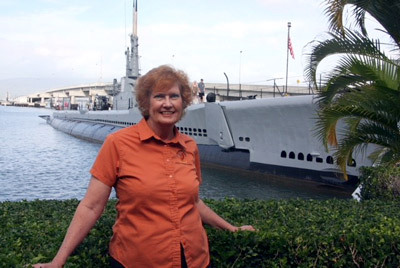 Now a museum curator for the USS Bowfin Submarine Museum & Park, she reflects on her passion for history, her time at UH West O‘ahu and her current work. I’m a Georgia girl. Born and raised.Anyone who knows me will tell you I’m proud of my southern roots. My favorite quote from Rose O’Neil Greenhow is, “I am a Southern woman, born with revolutionary blood in my veins . . . Freedom of speech and of thought were my birthrights, guaranteed by our charter of liberty, the Constitution of the United States, and signed and sealed by the blood of our fathers.”I just love being from the American South. On to other interests. Anyone who knows me is well aware of my love of cats (enough said), once I graduated from University of Hawai‘i–West O‘ahu, I fell in love with the harp and at 40 something – purchased a harp, sight unseen. Took harp lessons for ten years – until my teacher left for Oregon and I continue to stay in touch with my harp circle of friends and still play at church from time to time. Oh, did I mention I love college football? Saturdays in the fall are busy from 6 a.m. to midnight depending on where UH is playing! Go Warriors! And Bama, And Georgia AND Oklahoma! What first got you interested in history? Why do you enjoy it? My husband took me out of the South and moved me around a bit – Philadelphia, Jacksonville, Hawai‘i, San Diego and back to Hawai‘i. I started work at USS Bowfin Submarine Museum & Park thinking we would be leaving the island after his retirement from the Navy. Twenty years later, I am still here. I was in the museum and it was June 1994 – a young man came in and asked about D-Day – I gave him a quick answer and realized at the time that museums are adult learning centers. All we can do is plant a seed and hope they plant it where they go. What a classroom it has been for me. Today, history continues to excite me. History has a revolving door. New technologies revive old mysteries. Most recently, technology has located lost WWII submarines and over 70 years later, families are finding closure. 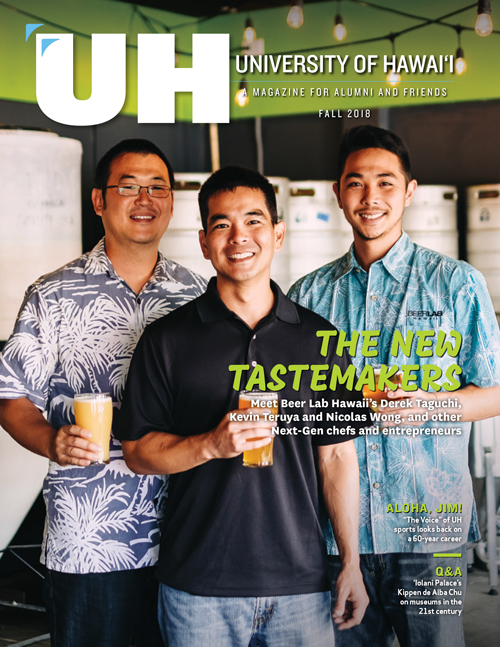 Why did you choose to go to UH West O‘ahu? Once I finished with Leeward CC it was the most practical choice. As a non-traditional student, I was not going to drive to the Mānoa campus. West O‘ahu offered me a perfect solution to finish my degree. UHWO gave me an opportunity to earn that coveted four-year degree. It was a wise choice. It was close to home, the professors continued to be engaging and supportive, and the professor to student ratio was just right. What’s your favorite memory of your time at UH West O‘ahu? The friends I made at West O‘ahu. Although we’ve gone our separate ways, we still are in touch.From Hawai‘i to Alabama to Washington, DC. I’ve also had some wonderful post-college years visiting with my professors. I’ve helped them out with interns over the years – giving them a place to exercise their love of history. What a great way to pay it forward for all the memories UHWO has given me. What line of work are you in currently? What kinds of things does your job entail? What are some words of advice you would give a current student who is interested in the field of history? Follow your passion and not your checkbook. History is an open book with unlimited opportunities to follow; public relations, education, archivist, loan management – the list is endless for history majors not just in the classroom but in museums too! What’s in store for the future? Any interesting upcoming projects? USS Bowfin Submarine Museum & Park is in the middle of a museum expansion and a name change. Many things are happening behind the scenes so keep an eye out in 2019 – 2020 for a new submarine museum to surface.